Doesn’t everyone know that if you eat just one of one thing you’ll lose weight? He’ll, it would be cardboard. The question is, how long can you go on doing it? The grapefruits are tumbling. Or, rather, rumbling. Or both. Some described the scene when we opened the door of the dilapidated trailer home as “not unabsurd,” hoping to avoid the jejune route of saying merely “absurd.” Some of the grapefruits (or is it just “fruit”?) were blue with mold on their bottoms, having sat in enormous crates for months, fermenting under the pressure of their comrades above, like submariners crushed into the last remaining air void of a doomed U-boat. I told my mother it was a bad idea. This was two months ago. Not the sole eating of the grapefruit, but the shacking up with the semi-driver who hiked the stuff up from Port St. Joe. He’s long gone. Later, a detective in his last month of duty before retirement will die in a shootout with him. You know how that goes. Reality imitates Hollywood once again. But right now, it’s the issue of how do we get to Ma’s body through all this citrus. Be still. Be very very still. Can you hear the blood rushing in your ears? Be so still that dust motes seem to zoom past you like asteroids. Be so still that the blood rush builds and build until it sounds like a Niagra. And you in the barrel, going over the falls of your own blood. Wait. Weight. You are nearing the edge. You are nearer. Nearer. And then. And then? Now. Now is that crucial moment, where there is no water to hold you. That cartoon instant when you are suspended in mid-air. Weightless. The Patron Saint of Everything That is Not Gravity. Stay there. Stay in that place in your mind. Repeat this process at least one-hundred times a day. It’s the only exercise you will ever need. Ever. And don’t ask me to define “ever.” That’s another Niagra we will choose not to go over today. Nothing but porridge. And it has to be just right. So there are two problems right there that will keep your mind off food while you actually prepare it. That’s the paradox you are shooting for. You see, first, what in the hell is porridge? Legumes, peasemeal, groats. Groats? Some milk. Barley? Grits. All handy items, right? Hey, Honey, can you pass the peasemeal? So, after the cashier laughs her head off when you respond to her Did you find everything okay with I need peasemeal, you head home in shame and go through the ritual. Husband stands over the stove, stirring for a while, and prepares three bowls. Meanwhile, you stand outside wearing your wig with the blonde braids and your blue gingham dress. If the weather doesn’t permit, you simply wait in the mudroom. At first, you asked him to wear a grizzly costume, but that didn’t last—the head caused obvious visual challenges unconducive to porridge cooking, and the body suit was just too damn hot, even with all the kitchen windows open in the dead of December—so now he just growls apathetically and makes perfunctory clawing motions when he’s not stirring. He sets the three bowls out and leaves. Three bowls, and one has to be just right. And do you know how hard it is to get something just right? If you think about it, the very idea of “just right” is a conundrum, a mercurial moment in time, an exact nano-second when the temperature of something that touches one’s lips is neither too hot not too cold. “Just right” harkens the Sorites paradox; that is, if you think of heat as a heap, and you continue taking away degrees and throw in the element of time, there will come the moment when the porridge is just right. But only for a moment. Thus, even if did have a hankering for groat gruel, or whatever, you can eat so little that is “just right” that you actually do limit caloric intake. Plus, throw in the fun of your husband chasing you around after he has discovered you in the “just right” bed (let’s not even get into that) and you have the recipe for some real weight loss. Until the divorce. The key was rotation. Every forty minutes eat another kind: walnuts at 8:00, peanuts at 8:40, pistachios at 9:20, and so on and so on. You could even substitute nut butters, but keep in mind that the exchange ratio is off by about .38 of an ounce. And also keep in mind that roasted soybeans are not nuts, nor is Chock Full o’Nuts. Over time you develop an algorithm that makes Plank’s Constant look simple. But who am I kidding? I don’t even know what Plank’s Constant is. But I do know this: after a certain point, you realize that everything, no matter how seemingly logical and fixed, is just a concept. Two and two is four, right? But even a machine with the same mass as the Earth can’t calculate fast enough to get beyond multiplying 52 to the – 32 power by 62,000. At that point you get into so many zeroes that you have to resort to transcomputationalsomethingorother. And you can’t make butter out of zeroes. Just like you can’t divorce your own sister. That’s too bad. Anyway, nuts are good for you. They have the good kind of fats. Eat more nuts. Most people give up after three. He is so thin, that even if he were a haiku, he’d come up short. That doesn’t make much sense, given that we are talking about someone who is thin, not small of stature. But, you know, we’re talkin’ bout a man who mailed himself to himself. She is looking at Frans Synder’s Still Life With Fruits, Vegetables, Game, and a Live Monkey, circa 1637. Just looking. The whole vicarious thing. Nothing will ever pass the lips, but can it be woven into the fabric of her mind enough to sate her hunger? That’s the idea. Before this one it was Anabale Carracci’s The Bean Eater, and before that is was Giuseppe Arcimboldo’s Emperor Rudolf II, with a face so delicious you could just eat him alive. If your diet allowed it. Back to the current painting. Why a live monkey? Amongst all the food? She crinkles her mouth in a light display of disgust. But what did they say in her art history class? Something about the monkey being a symbol of harmony, of jest, of a productive marriage. A productive marriage. The monkey (a capuchin? she thinks. She’s never been good with monkeys) does indeed remind her a little of her former husband. The tiny face. The ever-present smirk, even when he maintained he wasn’t smirking. How can you smirk in sadness? she once asked him. Can you smirk remorse? No, he couldn’t. She wished she had something to blame, some tipping point that she could hold in her mind as the reason for the end, but it was just once of those cases in which the weight of the things breaking two people apart slowly overtakes the weight of that keeping them together, and one day, you wake up, and the scales have betrayed you. Weight. That’s funny, she thinks. And wait. Wait and do nothing and the weight slowly overtakes you. You are in the woods. Lost. You hold yourself against the wind. Four hours ago a friendly stranger dropped you off. Is that crunching of leaves made by your own feet? It’s hard to tell. Maybe someone is after you. Soon the moon will appear, luminescent as a round drive-in movie screen. You remember when your parents took you to the drive in. You were four. There was a playground in the front of the screen, and you used to ride a metal duck mounted on a large spring. The idea was that you could bounce and sway to your heart’s delight, but in this case, the tension in the spring had been depleted by time and use. All you did was slowly sag forward until you were face to face with the gravel. And there you stayed. For a long time. Until one of your parents took a bathroom break and found you on their way to the snack bar for some dancing popcorn. That had been your life so for. Stuck on the duck. Waiting for your parents to rescue you. But no more. Thus the stranger. The forest. The running. No food or water. Live on berries and bark, dip your hand into an icy stream. Were those footsteps you heard behind you? All your life you had heard footsteps behind you. Now you know they are real. As the blood-red sun goes down, you stand on a bridge and scream. During the late evening, after his wife has gone to bed, he slices all the carrot sticks he did not eat earlier in the day into even smaller sticks. He promised his wife two things for their twenty-fifth anniversary: one, that he would lose twenty-five pounds; and two, that they would return to Paris and kiss under the Eiffel Tower. Both promises are probably unrealistic, but since he lost his job as the regional supervisor of Clearwater Ice Delivery, the Paris part is pure fantasy. Thus, he will surprise her with a Tower made of carrots, held together by tiny drops of superglue, which, as anybody knows, isn’t so super after all as it fails to adhere to anything with the slightest bit of moisture. That added degree of difficulty, though, he counts on to impress her even further, counterbalancing—if that’s possible—the lack of a trip. He places one of the carrots into his mouth and crunches. He remembers morphemes for some reason. Ninth grade. A carrot is not a car that rots. But, man, that is what they sure taste like. Especially after the, what, 600th one? Mirror, mirror. When the dwarf asks, don’t laugh. Constantinople, Istanbul, Ho Chi Minh City, Detroit rock City. What do these all have in common? None is an anagram for Be a Saint. And so you ain’t. You are so alive you can see the light of stars Van Gogh-ing across the night sky. You are your own time machine, yet you can go back in time only one second, so your immediate past eternally flickers before you like a bad DVD. So many pills. So little time. Ha ha. You could run a mile right now. You could run a mile in a phone booth. Isn’t that what they always said about you? He could run a mile in a phone booth without touching the sides. But they don’t make phone booths anymore. They are as gone as the U.S. Postal Service. Gone as you. Used to be you could catch anything thrown at you. Pigskin. As soon as the rigid discipline of practice was gone, you blew up. You ate the pigskin with a side of fries. 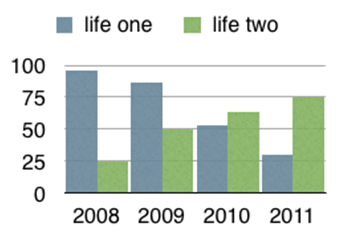 As you can see from the attached chart, life one, the person you are, was on a steep decline, while life two, the person you could have been was on the rise. And why? You’re fat, stupid. How many times can I say this? NO BREAD. I don’t care if last name is Baker, if you’ve been making popovers for the past thirty years, if you use dumb logic like a fat baker is a happy baker. Stop the Madness. Listen. You get up. You get some protein in that body. No carbs. Do you hear me? But what about steel cut oats? you ask. NO, I say. A thousand times N O. You are a forager. That’s your past. Leaves and meat. When’s that last time you saw a caveman baking? They were running, man. Running to eat, running to live. Berries, grass, with some roasted Mastadon tossed on topic. You think cinnamon rolls are evil? Bran muffins will eat you alive, baby. Don’t make me show you the pie chart. Ha ha. Pie chart. What the Ouija said. What the dead eat. You don’t really like spinach, so you go for schmutz, the kosher equivalent of dirt. You are surprised at how easy it is to find. Edible dirt. The guy at the counter of the little natural food store around the corner says it’s the hot thing now. Toss it on a salad. And so you do. Just make sure there is no spinach. Okay, maybe a little, because that’s what the Ouija said. And you do this every day, and you do it three times a day, and soon the weight comes off, like flesh, like flesh falling off bone, and you know what it is like to taste your way through the earth toward light, toward the glow of the unknown. Indeed, the question really is how long can can you go on doing it? Tags: Fiction Issue, Kevin Griffth, Spring 2012, Varieties of Diets, Volume 42. Bookmark the permalink.